For other uses of Gaia', see Gaia (disambiguation)'. Meet Riku on Destiny Islands. The Ends of the Earth is a Keychain for Terra's Keyblade that is found in Kingdom Hearts II Final Mix and Kingdom Hearts Birth by Sleep. Like Terra's other Keyblades, it is able to shift into multiple forms, including a whip, a spinning-cog weapon and a much-larger Keyblade. Terra also uses this Keychain in order to form his Keyblade Glider and Ultima Cannon. Terra's Keyblade develops this form after he chooses Riku to inherit the Keyblade. 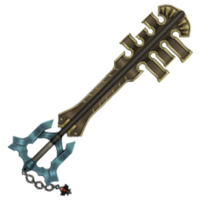 Terra's Keyblade takes this form once his body is stolen by Master Xehanort and his armor becomes the Lingering Will, although it temporarily returns to its Earthshaker form in order to rescue Aqua in the Realm of Darkness. The Ends of the Earth returns to the Lingering Will and remains with it, up until the Will is met by and attacks Sora. The Lingering Will continues to wield the Ends of the Earth, and uses its transformations to disable Terra-Xehanort at the Keyblade Graveyard. After Terra retakes control of his body, the Lingering Will and its Ends of the Earth disappear[please confirm], and Terra uses the Earthshaker Keychain instead. Being an upgraded version of the Earthshaker, the Ends of the Earth features a longer and more extravagant blade with teeth on both sides at the tip of the blade. The hand guard also elongates to form a wing-like shape of sorts. The Keychain is a rock fragment similar to the one on the Earthshaker. In Kingdom Hearts II Final Mix, it doesn't have a Keychain, as the Keychain had not been designed by the time that Kingdom Hearts II Final Mix was released. In Kingdom Hearts Birth by Sleep, the blade's length appears to be slightly smaller, and the teeth of the blade aren't quite as wide as the Kingdom Hearts II Final Mix version. "Ends" can refer to the death or result of something, while "earth" refers to the Latin meaning of Terra's own name. "Bane" is a source of misery. Gaia is a deity in Greek mythology representing the Earth and the mother of the Titans. Her Roman equivalent was named "Terra" or "Tellus". "Gaia" is also a recurring term in the Final Fantasy series. The term "Ends of the Earth" is also a common colloquialism for extreme effort or will, possibly symbolizing the powerful will that Terra possesses. The Ends of the Earth's Keychain-less form seen in Kingdom Hearts II Final Mix. The Ends of the Earth in its Ultima Cannon form. The Ends of the Earth in its Keyblade Glider form.